The version 15.08 marks the beginning of Genode as day-to-day OS as one of the project's core developers switched to using Genode/NOVA on his machine, stressing the OS infrastructure we created over the course of the last seven years. Thanks to components like VirtualBox, the Noux runtime for GNU software, the Linux wireless stack and Rump-kernel-based file systems, the transition went actually much smoother than expected. So other members of the team plan to follow soon. Section Genode as day-to-day operating system gives an overview of the taken approach. Genode's use as general-purpose OS provided the incentive for most of the improvements featured by the current release, starting with the addressing of the long-standing kernel-memory management deficiencies of the NOVA kernel (Section NOVA kernel-resource management), over enhancements of Genode's tracing and file-system facilities, to vast improvements of the guest-host integration of VirtualBox when running on Genode. The release is accompanied with a second line of work led by our friends at Codelabs: Enabling Genode to run on top of their Muen separation kernel as described in Section Genode on top of the Muen Separation Kernel. 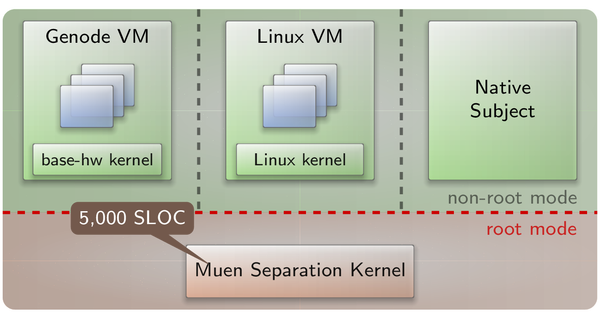 Muen is a low-complexity kernel for the 64-bit x86 architecture that statically partitions the machine into multiple domains. In contrast to microkernels like the ones already supported by Genode, the assignment of physical resources (such as memory, CPU time, and devices) happens at system-integration time. Since an isolation kernel does not have to deal with dynamic resource management at runtime, it is less complex than a general-purpose microkernel. This makes it relatively easy to reason about its strong isolation properties, which, in turn, makes it attractive for high-assurance computing. With Genode being able to run within a Muen domain, the rich component infrastructure of Genode can be combined with the strong isolation guarantees of Muen. This section was written by Adrian-Ken Rueegsegger and Reto Buerki who conducted the described line of work independent from Genode Labs. After completing our x86_64 port of the Genode base-hw kernel, which was featured in the previous release, we immediately started working on our main goal: running a Genode system as guest on the Muen Separation Kernel (SK). This would enable the Muen platform to benefit from the rich ecosystem of Genode. For those who have not read the 15.05 Genode release notes, Muen is an Open-Source microkernel, which uses the SPARK programming language to enable light-weight formal methods for high assurance. The 64-bit x86 kernel, currently consisting of a little over 5'000 LOC, makes extensive use of the latest Intel virtualization features and has been formally proven to contain no runtime errors at the source-code level. The new hw_x86_64_muen platform, as the name implies, extends the hw_x86_64 base-hw kernel by replacing the PIC and timer drivers with paravirtualized variants. In contrast to other kernels supported by Genode, the architecture with Muen is different in the sense that the entire hw_x86_64_muen Genode system runs as guest VM in VMX non-root mode on the SK. From the perspective of Muen, Genode is executed on top of the kernel like any other guest OS without special privileges. This loose coupling of Muen and Genode base-hw enables the robust combination of a static, low-complexity SK with a feature-rich and extensive OS framework. The result is a flexible platform for the construction of component-based high-assurance systems. People interested in giving the hw_x86_64_muen platform a spin can find a small tutorial at repos/base-hw/doc/x86_64_muen.txt. For several years, the NOVA kernel has served as Genode's primary base platform on x86. The main reasons for this choice are: the kernel provides - among the supported x86 kernels - the richest feature set like the support of IOMMUs, virtualization, and SMP. It also offers a clean design and a stable kernel interface. The available kernel-interface specification and the readable and modern source base are a pleasure to work with. Hence, Genode Labs is able to fully commit to the maintenance and further evolution of this kernel. Nevertheless, since the beginning, the vanilla kernel lacks one essential feature to reliably host Genode as user-land, namely the proper management of the memory used by the kernel itself (in short kernel-memory management). In the past, we already extended the kernel to free up kernel resources when destroying kernel objects, e.g., protection domains and page-tables, threads, semaphores, and portals. Still, on Genode/NOVA, a component may trigger arbitrary kernel-memory consumption during RPC by delegating memory, capabilities, or by creating other components via Genode's core component. If the kernel memory gets depleted, the kernel panics with an "Out of memory" message and the entire Genode scenario stops. In principal, the consumption of kernel memory can be deliberately provoked by a misbehaving (greedy) component. But also during the regular day-to-day usage of Genode, can such a situation occur when the system is used in a highly dynamic fashion. For example, compiling and linking source code within the noux environment constantly creates and destroys protection domains, threads, and memory mappings. Our nightly test of compiling Genode within noux triggers this condition every once in a while. The main issue here is that the consumption of kernel memory is not accounted by Genode. The kernel interface does not support such a feature. Kernels like seL4 as well as Genode's custom base-hw kernel show how this problem can be solved. To improve the current situation - where the overall kernel memory is a fixed amount - we extended NOVA in the following ways: First, the NOVA kernel accounts any kernel memory consumption per protection domain. Second, each process has a limited amount of kernel-memory quota it can use. Last, the kernel detects when the quota limit of a protection domain is reached. Free up kernel memory if possible, e.g., revoke memory delegations, which can be re-created. We implemented the steps above inside the NOVA kernel and extended Genode's core component to handle such OOM situations. All system calls beside the IPC call/reply may now return an error code upon depletion of the quota. Most of these system calls can solely be performed by core and are handled inside core's NOVA-specific platform code. In the case of IPC call/reply operations, we desired to handle OOM cases transparently to Genode user-level components. Therefore, each thread in Genode/NOVA now gets constructed with an OOM IPC portal attached. This portal is served by the pager thread in core and is traversed on OOM occurrences during IPC operations. If a pager thread receives such an OOM IPC, it decodes the involved IPC sender and IPC receiver and locates the appropriate core-internal paging objects. The currently implemented out-of-memory policy tries to upgrade the quota. If this is not possible, an attempt to revoke memory mappings from the OOM-causing protection domain is made. This implicitly frees-up some kernel memory (e.g., mapping nodes). If none of the responses suffices, the handler stops the OOM-causing thread and writes a message to the system log. The current policy implementation constitutes a rather rough heuristic, which may not suffice under all circumstances. In the future, we would like to specify a distinct policy per component, e.g. depending on prior known memory usage patterns. For example, some components follow well-known usage patterns and therefore a fixed upper quota limit can be specified. Other components are highly dynamic and desire quota upgrades on demand. There are many more combinations imaginable. Our current plan is to collect more experience over the next months with this new kernel mechanism. Based on our observations, we may externalize such policy decisions and possibly make them configurable per component. The current implementation however, already avoids the situation that the kernel goes out of service if a single component misbehaves kernel-memory-wise. The machine used is a Lenovo Thinkpad X201. We settled on this five-year-old machine for several reasons. First, it is a very solid platform with a nice form factor. Second, it features Intel's AMT (Active Management Technology), which is handy to obtain low-level system logs in the case something goes wrong. Third, refurbished machines of this type can be obtained for as little as 200 EUR. Finally, an older machine reinforces the need for good performance of the operating system. So it creates a natural incentive for Norman to find and address performance bottlenecks. Our modified version of the NOVA microhypervisor is the used kernel. The user interface is based on our custom GUI stack including the nitpicker GUI server as well as the window manager and its companion components (decorator, layouter, pointer) we introduced in version 14.08. The display is driven by the VESA driver. User input is handled by the PS/2 driver for handling the laptop keyboard and trackpoint, and the USB driver for handling an externally connected keyboard and mouse. Network connectivity is provided by our port of the Intel Wireless stack that we introduced with the version 14.11. Our custom AHCI driver provides access to the physical hard disk. File-system access is provided by our Rump-kernel-based file-system server. A simple Genode shell called CLI monitor allows the user to start and kill subsystems dynamically. Initially, the two most important subsystems are VirtualBox and Noux. VirtualBox executes a GNU/Linux-based guest OS that we refer to as "rich OS". The rich OS serves as a migration path from GNU/Linux to Genode. It is used for all tasks that cannot be accomplished directly on Genode yet. At the beginning of the transition, the daily routine still very much depends on the rich OS. By moving more and more functionality over to the Genode world, we will eventually be able to make the rich OS obsolete step by step. Thanks to VirtualBox' excellent host-guest-integration features, the VirtualBox window can be dynamically resized and the guest mouse cursor integrates seamlessly with Genode's pointer. VirtualBox is directly connected to the wireless network driver. So common applications like Firefox can be used. The noux runtime allows us to use command-line-based GNU software directly on Genode. Coreutils and Bash are used for managing files. Vim is used for editing files. Unlike the rich OS, the noux environment has access to the Genode partition of the hard disk. In particular, it can be used to update the Genode system. It has access to a number of pseudo files that contain status information of the underlying components, e.g., the list of wireless access points. Furthermore, it has limited access to the configuration interfaces of the base components. For example, it can point the wireless driver to the access point to use, or change the configuration of the nitpicker GUI server at runtime. As a bridge between the rich OS and the Genode world, we combine VirtualBox' shared-folder mechanism with Genode's VFS infrastructure. The shared folder is represented by a dedicated instance of a RAM file system, which is mounted in both the VFS of VirtualBox and the VFS of noux. As evidenced by Norman's use since June, the described system setup is sufficient to be productive. So other members of the Genode team plan to follow in his footsteps soon. At the same time, the continued use of the system from day to day revealed a number of shortcomings, performance limitations, and rough edges, which we eventually eliminated. It goes without saying that this is an ongoing effort. Eating our own dog food forces us to address the right issues to make the daily life more comfortable. Feature-wise the switch to Genode motivated three developments, namely the enhancement of Genode's CLI monitor, the improvement of the window manager, and the creation of a CPU-load monitoring tool. The original version of CLI monitor obtained the configuration data of its subsystems at start time via the Genode::config mechanism. But for managing complex scenarios, the config node becomes very complex. Hence, it is preferable to have a distinct file for each subsystem configuration. The new version of CLI monitor scans the directory /subsystems for files ending with ".subsystem". Each file has the same syntax as the formerly used subsystem nodes. This change has the welcome implication that subsystem configurations can be changed during the runtime of the CLI monitor, e.g., by using a concurrently running instance of noux with access to the subsystems/ directory. This procedure has become an essential part of the daily work flow as it enables the interactive evolution of the Genode system. To make the window manager more flexible while reducing its complexity at the same time, we removed the formerly built-in policy hosting the decorator and layout components as children of the window manager. Those components are no longer child components but siblings. The relationship of the components is now solely expressed by the configuration of their common parent, i.e., init. This change clears the way to dynamically replace those components during runtime (e.g., switching between different decorators). To improve the usability of the windowed GUI, we enabled the layouter to raise windows on click and to let the keyboard focus follow the pointer. Furthermore, the window manager, the decorator, and the floating window layouter became able to propagate the usage of an alpha channel from the client application to the decorator. This way, the decorator can paint the decoration elements behind the affected windows, which would otherwise be skipped. Consequently, partially transparent windows can be properly displayed. During daily system use, we started to wish to know in detail where the CPU cycles are spent. For example, the access of a file by the rich OS involves several components, including the guest OS itself, VirtualBox, rump_fs (file system), part_blk (partition access), ahci_drv (SATA device access), core, and NOVA. Investigating performance issues requires a holistic view of all those components. For this reason, we enhanced our existing tracing infrastructure (Section Enhanced tracing facilities) to allow the creation of CPU-load monitoring tools. The first tool in this category is the graphical CPU-load monitor located at gems/app/cpu_load_display/, which displays a timeline of the CPU load where each thread is depicted with a different color. Thanks to this tool, we have become able to explore performance issues in an interactive way. In particular, it helped us to identify and resolve a long-standing inaccuracy problem in our low-level timer service. In the previous release, we replaced our old audio driver with a new one that provided the same audio-out session interface. Complementing the audio-out session, we are now introducing a new audio-in session interface that can be used to record audio frames. It is modeled after the audio-out interface in the way how it handles the communication between the client and the server. It uses shared memory in the form of the Audio_in::Stream to transport the frames between the components. A server component captures frames and puts them into a packet queue, which is embedded in the Audio_in::Stream. The server allocates packets from this queue to store the recorded audio frames. If the queue is already full, the server will override already allocated packets and will notify the client by submitting an overrun signal. The client has to cope with this situation, e.g., by consuming packets more frequently. A client can install a signal handler to respond to a progress signal, which is sent by the server when a new Audio_in::Packet has been submitted to the packet queue. For now, all audio-in server components only support one channel (left) although the audio-in session interface principally supports multiple channels. The dde_bsd audio_drv is the first and currently only audio driver component that was extended to provide the audio-in session. To express this fact, the driver was renamed from audio_out_drv to audio_drv. In contrast to its playback functionality, which is enabled by default, recording has to be enabled explicitly by setting the configuration attribute recording to yes. If the need arises, playback may be disabled by setting playback to no. In addition, it is now possible to configure the driver by adjusting the mixer in the driver's configuration node. For the time being, the interface as employed by the original OpenBSD mixer utility is used. In addition to selecting the recording source, the playback as well as the recording volume are raised to the maximum. Information about all available mixers and settings in general may be obtained by specifying the verbose attribute in the config node. The enriched driver is accompanied by a simple monitor application, which directly plays back all recorded audio frames and shows how to use the audio-in session. It can be tested by executing the repos/dde_bsd/run/audio_in.run run script. There are also changes to the audio-out session itself. The length of a period was reduced from 2048 to 512 samples to accommodate for a lower latency when mixing audio-out packets. A method for invalidating all packets in the queue was also added. Unlike traditional operating systems that rely on a global name space for files, each Genode component has a distinct view on files. Many low-level components do not even have the notion of files. Whereas traditional operating systems rely on a virtual file system (VFS) implemented in the OS kernel, Genode's VFS has the form of a library that can optionally be linked to a component. The implementation of this library originated from the noux runtime introduced in version 11.02, and was later integrated into our C runtime in version 14.05. With the current release, we take the VFS a step further by making it available to components without a C runtime. Thereby, low-complexity security-sensitive components such as CLI monitor become able to benefit from the powerful VFS infrastructure. The VFS itself received a welcome improvement in the form of private RAM file systems. A need for process-local storage motivated a conversion of the existing ram_fs server component to an embeddable VFS file system. This addition to the set of VFS plugins enables components to use temporary file systems without relying on the resources of an external component. Having had a good experience with our Block::Driver implementation, which wraps the block-session interface and takes care of the packet-stream handling, thus easing the implementation of driver and other block components, we observed that this approach did not provide enough flexibility for NIC-session servers. For example, NIC servers are bi-directional and when a network packet arrives the server has to make sure that there are enough resources available to dispatch the network packet to the client. This has to be done because the server must never block, e.g., by waiting for allocations to succeed or for an empty spot in the packet queue of a client. Therefore, such a non-blocking NIC server needs to validate all preconditions for dispatching the packet in advance and, if they cannot be met, drop the network packet. In order to implement this kind of behavior, NIC-session servers must have direct access to the actual NIC session. For this reason, we removed the Nic::Driver interface from Genode and added a Nic::Session_component that offers common basic packet-stream-signal dispatch functionality. Servers may now inherit from this component and implement their own policy. We adjusted all servers that implement NIC sessions to the new interface (dde_ipxe, wifi, usb, nic_bridge, OpenVPN, ...), and thereby unified all networking components within Genode. Recent Genode-based system scenarios like the one described in Section Genode as day-to-day operating system consist of dozens of components that interact with each other. For reasoning about the behaviour of such scenarios and identifying effective optimization vectors, tools for gathering a holistic view of the system are highly desired. With the introduction of our light-weight event-tracing facility in version 13.08, we laid the foundation for such tools. The current release extends core's TRACE service with the ability to obtain statistics about CPU utilization. More specifically, it enables clients of core's TRACE service to obtain the execution times of trace subjects (i.e., threads). The execution time is delivered as part of the Subject_info structure. In addition to the execution time, the structure delivers the information about the affinity of the subject with a physical CPU. At the current stage, the feature is available solely on NOVA since this is our kernel of choice for using Genode as our day-to-day OS. On all other base platforms, the returned execution times are 0. To give a complete picture of the system's threads, the kernel's idle threads (one per CPU) are featured as trace subjects as well. Of course, idle threads cannot be traced but their corresponding trace subjects allow TRACE clients to obtain the idle time of each CPU. By obtaining the trace-subject information in periodic intervals, a TRACE client is able to gather statistics about the CPU utilization attributed to the individual threads present (or no longer present) in the system. One instance of such a tool is the new trace-subject reporter located at os/src/app/trace_subject_reporter. It acts as a TRACE client, which delivers the gathered trace-subject information in the form of XML-formatted data to a report session. This information, in turn, can be consumed by a separate component that analyses the data. In contrast to the low-complexity trace-subject reporter, which requires access to the privileged TRACE services of core, the (potentially complex) analysing component does not require access to core's TRACE service. So it isn't as critical as the trace-subject monitor. The first representative of a consumer of trace-subject reports is the CPU-load display mentioned in Section CPU-load monitoring and depicted in Figure 3. In addition to the CPU-monitoring additions, the tracing facilities received minor refinements. Up to now, it was not possible to trace threads that use a CPU session other than the component's initial one. 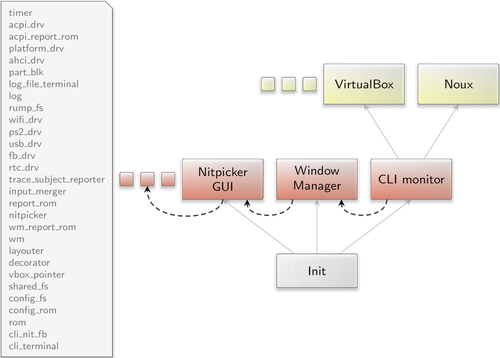 A specific example is VirtualBox, which employs several CPU sessions, one for each priority. This problem has been solved by associating the event logger of each thread with its actual CPU session. Consequently, the tracing mechanism has become able to trace VirtualBox, which is pivotal for our further optimizations. Our ambition to use Genode as our day-to-day OS raises the need for custom graphical applications. Granted, it is principally possible to base such applications on Qt5, which is readily available to native Genode components. However, for certain applications like status displays, we prefer to avoid the dependency on an overly complex GUI tool kit. 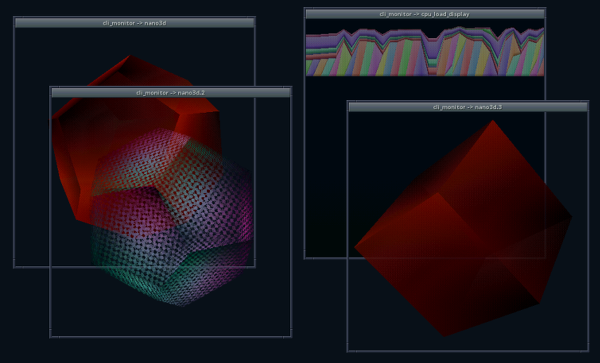 To accommodate such applications, Genode hosts a small collection of low-complexity graphics functions called painters. All of Genode's low-complexity graphical components such as nitpicker, launchpad, window decorator, or the terminal are based on this infrastructure. With the current release, we extend the collection with two new painters located at gems/include/polygon_gfx. Both draw convex polygons with an arbitrary number of points. The shaded-polygon painter interpolates the color and alpha values whereas the textured-polygon painter applies a texture to the polygon. The painters are accompanied by simplistic 3D routines located at gems/include/nano3d/ and a corresponding example (gems/run/nano3d.run). With the nano3d demo and our new CPU load display, the screenshot above shows two applications that make use of the new graphics operations. Until now, the platform driver on x86-based machines was formed by the ACPI and PCI drivers. The ACPI driver originally executed the PCI driver as a slave (child) service. The ACPI driver parsed the ACPI tables and provided the relevant information as configuration during the PCI-driver startup. We changed this close coupling to the more modern and commonly used report_rom mechanism. When the new ACPI driver finishes the ACPI table parsing, it provides the information via a report to any interested and registered components. The report contains among other the IRQ re-routing information. The PCI driver is a component, which - according to its session routing configuration - plays the role of a consumer of the ACPI report. With this change of interaction of ACPI and PCI driver, the policy for devices must be configured solely at the PCI driver and not at the ACPI driver. The syntax, however, stayed the same as introduced with release 15.05. Finally, the PCI driver pci_drv got renamed to platform_drv as already used on most ARM platforms. All files and session interfaces containing PCI/pci in the names were renamed to Platform/platform. The x86 platform interfaces moved to repos/os/include/platform/x86/ and the implementation of the platform driver to repos/os/src/drivers/platform/x86/. In order to unify and simplify the writing of run scripts, we added the commonly used platform configuration to the file repos/base/run/platform_drv.inc. This file may be included by any test run script in order to setup a default platform driver configuration. In addition, the snippet provides the following functions: append_platform_drv_build_components, append_platform_drv_config and append_platform_drv_boot_modules. The functions add necessary information to the build_components, config and boot_modules run variables. The platform_drv.inc also contains the distinction between various ARM/x86 platforms and includes the necessary pieces. Hence, run scripts are largely relieved from platform-specific peculiarities. During Hack'n Hike 2015, we had access to a server that featured a Broadcom network card. Therefore Guido Witmond performed the first steps to enable Broadcom's BCM 57cxx cards. With this preliminary work in place, we were quickly able to perform the additional steps required to add BCM 57cxx support to Genode. The VESA driver now reports the frame buffer's line width instead of the visible width to the client. This fixes a possible distortion if these widths differ, at the cost that content in the right-most area might be invisible in such cases. In the previous release, we implemented support for the transparent integration of the guest mouse pointer with nitpicker via the VirtualBox guest additions and the vbox_pointer component, which is capable of rendering guest-provided mouse-pointer shapes. Now, we extended vbox_pointer by a policy-based configuration that allows the selection of ROMs containing the actual mouse shape based on the nitpicker session label or domain. With this feature in place, it is possible to integrate several VirtualBox instances as well as dedicated pointer shapes for specific components. To see the improved vbox_pointer in action give run/vbox_pointer a shot. VirtualBox now notifies the guest operating system about screen-size changes (for example if the user resizes a window, which shows the guest frame buffer). The VirtualBox guest additions can use this information to adapt the guest frame buffer to the new size. Guest operating systems can now use multiple virtual CPUs, which are mapped to multiple host CPUs. The number of virtual CPUs can be configured in the .vbox file. At some point, the use of VirtualBox as a stop-gap solution for using Genode as everyday OS raises the need to handle audio. With this release, we address this matter by enabling preliminary audio support in our VirtualBox port. A back end that uses the audio-out and audio-in sessions to playback and record sound samples has been added. It disguises itself as the OSS back end that is already used by vanilla VirtualBox. Since Genode pretends to be FreeBSD in the eyes of VirtualBox (because Genode's libc is based on FreeBSD's libc), the provisioning of an implementation of the OSS back end as used on FreeBSD host systems is the most natural approach. The audio support is complemented by adding the necessary device models for the virtual HDA as well as the AC97 devices to our VirtualBox port. For now, it is vital to have the guest OS configure the virtual device in a way that considers the current implementation. For example, we cannot guarantee distortion-free playback or recording if the guest OS uses a period that is too short, typically 10ms or less. There are also remaining issues with the mixing/filtering code in VirtualBox. Therefore, we bypass it to achieve better audio quality. As a consequence, the device model of the VM has to use the same sample rate as is used by the audio-out and audio-in sessions (44.1kHz). to the .vbox file manually or configuring the VM accordingly by using the GUI. On Intel platforms, we use the Bender chain loader from the Morbo multiboot suite to detect available COM ports of PCI plug-in cards, the AMT SOL device, or as fall back the default comport 1. The loader stores the I/O port information of the detected cards into the BIOS data area (BDA), from where it is retrieved by core on boot and subsequently used for logging. With this release, we added the BDA parsing to base-hw on x86-64 and enabled the feature in the run tool. As a prerequisite, we had to fix an issue in bender triggered by the loading of only one (large) multi-boot kernel. Consequently, its binary in tool/boot/bender was updated. One of the main advantages of the base-hw platform is that the memory trading concept of Genode is universally applied even with regard to kernel objects. For instance, whenever a component wants to create a thread, it pays for the thread's stack, UTCB, and for the corresponding kernel object. The same applies to objects needed to manage the virtual address space of a component with the single exception of page tables. Normally, when the quota, which was donated by a component to a specific service, runs out, the component receives an exception the next time it tries to invoke the service. The component can respond by upgrading the respective session quota. However, in the context of page-fault resolution, this is particularly difficult to do. The allocation and thereby the shortage of memory becomes evident only when the client produces a page fault. Therefore, there is no way to inform the component to upgrade its session quota before resolving the fault. Instead of designing a sophisticated protocol between core and the other components to solve this problem, we decided to simplify the current page-fault resolution by using a static set of page-tables per component. Formerly, page tables were dynamically allocated from core's memory allocator. Now, an array of page tables gets allocated during construction of a protection domain. When a component runs out of page tables, all of its mappings get flushed, and the page tables are populated from scratch. This change greatly simplifies the page-table handling inside of base-hw. On x86-based hardware, user-level device drivers have become able to specify the trigger mode and polarity of the interrupts when requesting an IRQ session. On ARM, those session parameters are ignored. This change enables the x86_64 platform to support devices, which use arbitrary trigger modes and polarity settings, e.g., AHCI on QEMU and real hardware. Genode's device-driver support when using the Fiasco.OC kernel as base platform received an upgrade. First, principle support for the Raspberry Pi was added. To make this platform useful in practice, a working USB driver is important. I.e., the network interface is connected via USB. Hence the USB driver got enabled for Fiasco.OC, too. As a result, Genode's software stack can now be used on the Raspberry Pi by using either our custom base-hw kernel or Fiasco.OC. Second, support for the Odroid-X2 platform using the Exynos4412 SoC was added, which includes the drivers for clock management (CMU), power management (PMU) as well as USB. Thanks to Reinier Millo Sánchez and Alexy Gallardo Segura for having contributed this line of work. We dropped the support for the ARM Versatile Express board from the Genode source tree to relieve our automated testing infrastructure from supporting a platform that remained unused for more than two years. The device driver environment kit (DDE Kit) was originally intended as a common API among the execution environments of ported user-level device drivers. However, over the course of the past years, we found that this approach could not fulfill its promise while introducing a number of new problems. We reported our experiences in the release notes of versions 12.05 and 14.11. To be able to remove the DDE-Kit API, we reworked the USB driver, our port of the Linux TCP/IP stack, and the wireless driver accordingly.